CANTON, Mass. 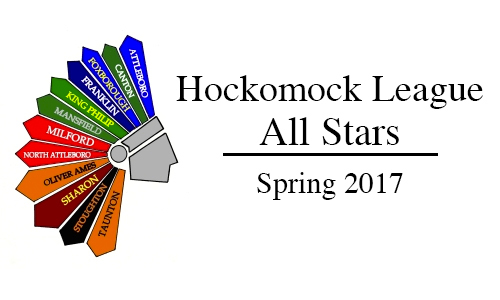 – During the second set of the D2 Central Semifinal between Hockomock rivals Canton and Milford, Bulldogs head coach Pat Cawley had to call a timeout with her side trailing. The Bulldogs had been in this situation before. In fact, it was just a couple weeks ago when Canton hosted the Scarlet Hawks for their second regular season meeting. In that much, just like Wednesday’s showdown, Canton won the opening set in relatively convincing fashion. During the October 20th showdown, the Scarlet Hawks rallied to win the second set. 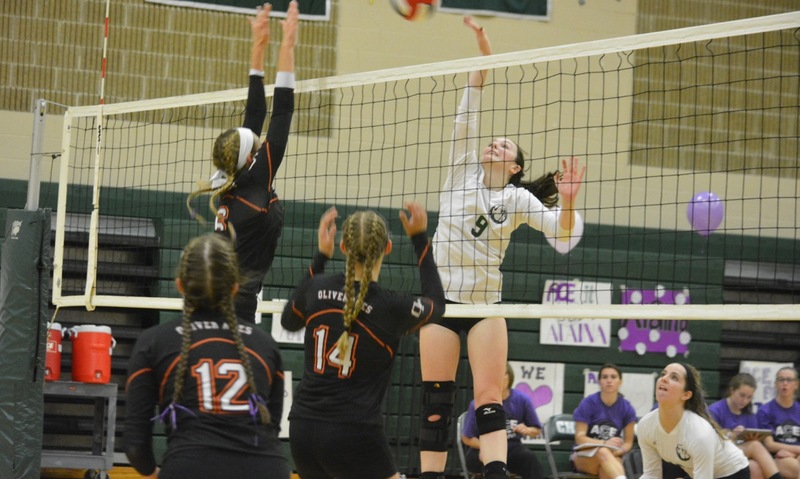 On Wednesday night, after Cawley’s timeout, Canton erased a six point deficit with a 14-2 run and went on to win the second set, and then the third in impressive fashion to score a 3-0 win. With the win, Canton advances to the D2 Central Final for the second straight season. While Milford held a 12-6 lead, one of Casey Shea’s team-high nine kills sparked Canton’s run. An ace from Erika Lum tied the set at 12-12 and an ace from Julia Panico gave Canton its first lead of the set since the opening point at 14-13. Canton stretched its second set lead to 20-13 before Milford chipped away. The Scarlet Hawks won three straight points with the set on the line but a service error gave Canton a 25-20 win. Canton started the match with a pair of kills, setting the tone for the rest of the way while also getting Canton’s crowd – “the best crowd we ever had in Cawley’s 16 years – into the match early on. An ace from Maria Mackie forced Linda Zacchilli to call timeout with her squad down 10-4. Canton stretched the lead to double digits behind a pair of Milford errors but the Scarlet Hawks made a run at the end of the set to make it close. An ace from Ally Zagami brought Milford back within five (19-14) but Canton closed with a 6-2 run, punctuated by a block kill from Shea and outside hitter Hannah Jerrier. Shea and fellow middle Emma Murphy (eight kills, three blocks, no errors) were the key pieces in Canton’s offense. Setter Nicole Poole (17 assists, 13 digs, two kills) spread the offense around nicely but the Scarlet Hawks struggled to stop Shea and Murphy in the middle. “Our game plan this year is middles – they are our stronger players. Our outsides have come on stronger during the second half of the season too,” Cawley said. “There’s only one attacking player on this team that played significant last year at all, Emma Murphy in the middle. Casey Shea played on the weak side last year so we moved her to the middle. With the momentum of its side after winning the first two sets, Canton raced out to a quick 6-0 lead in the third set. A kill from Murphy and a kill from Shea sandwiched around a handful of Milford errors put the Bulldogs up 16-4. At one point during the set, Canton had three straight attacks blocked, but each time had a player there to cover. It was that one play that showed how well Canton handled the match defensively. Canton finished the final set with a 25-9 win, the majority of the Bulldogs’ early points come off errors from the Scarlet Hawks. “It wasn’t our day, we really didn’t bring our ‘A’ game,” Zacchilli said. “And we have been playing very, very well lately – even in practice. We’ve been really sharp, the kids have been focused. I had said to my coaches I was surprised we hadn’t seen the deer in the headlights look in the first two playoff games because none of the kids have tournament experience. I saw that look tonight. There were some nerves out there and when you get to this point, everyone is good. They’re going to score their points, they’re going to get the ball to the floor but when we have our opportunity, we can’t hit it into the net, we can’t make unforced errors. In her first year back at the helm, Zacchilli was pleased with the first year – taking a team that missed the postseason a year ago to the D2 Central Semifinals. Zagami led Milford with six kills and six aces, Allie Collins had eight assists and Kelley Reichert had five kills and 18 digs. Canton volleyball will take on top-seeded Hopkinton (19-2) on Saturday, at 4:00 at Wellesley High School in the D2 Central Final. 2nd Quarter: (KP) Cole Baker 20-yard field goal; (KP) Brendan Lydon 40 yard pass to Ethan Dunne (15 yards) and Shane Frommer (25 yards), C. Baker XP good. 3rd Quarter: (KP) B. Lydon 1 yard rush, C. Baker XP good; (A) Marc Dieu 2 yard rush, Paul Deluca XP good. 4th Quarter: (KP) John DeLuca 12 yard rush, XP no good; (KP) S. Frommer 12 yard rush, 2-point conversion no good; (KP) Giovanni Fernandez 65 yard rush, C. Baker XP good; (A) Tyler McGovern 37 yard pass to Elvin Sam, 2-point conversion no good. 2nd Quarter: (NA) Nick Rajotte 2 yard rush, Geoff Wilson XP; (NA) N. Rajotte 1 yard rush, G. Wilson XP; (NA) Chad Peterson 4 yard pass to Mario Bresko, G. Wilson XP. 3rd Quarter: (NA) C. Peterson 15 yard pass to Kyle McCarthy, G. Wilson XP; (NA) Brendan McHugh 1 yard rush, G. Wilson XP. 4th Quarter: (C) Dan Dillon 5 yard rush, XP good. 1st Quarter: (S) Izon Swain-Price 10 yard rush, XP missed. 2nd Quarter: (F) John Cronin 20 yard field goal; (S) I. Swain-Price 2 yard rush, Evan Gibb 2pt rush. 3rd Quarter: (S) E. Gibb 67 yard pass to Ryan Sullivan, Dave Cellucci 2pt rush; (S) I. Swain-Price 25 yard rush, XP good; (S) E. Gibb 27 yard pass to R. Sullivan, XP missed. 4th Quarter: (S) Alex Sjoquist 2 yard rush, XP good. 1st Quarter: (M) Conor Driscoll 25 yard interception return, Diogo DeSousa XP good; (M) Anthony DeGirolamo 61 yard pass to Kristian Connor, D. DeSousa XP good; (M) Nick Graham 2 yard rush, D. DeSousa XP good. 2nd Quarter: (M) A. DeGirolamo 25 yard pass to Ben Budwey, D. DeSousa XP good. 3rd Quarter: (M) N. Graham 5 yard rush, D. DeSousa XP good; (M) Joe Cox 2 yard rush, D. DeSousa XP good. 4th Quarter: (F) Alex Cregg 84 yard pass to Packie Watson, XP good. 1st Quarter: (T) Noah Leonard 19 yard pass to Adam McLaughlin, XP blocked. 2nd Quarter: (OA) Kyle Gagliardi 15 yard pass to Anthony Berksza, Leandro Moro XP good. 3rd Quarter: (T) Brevan Walker 66 yard run, 2pt failed. 4th Quarter: (T) N. Leonard 28 yard pass to Mike Fernandez, XP blocked; (T) TJ Mendes 21 yard rush, John Teixeira XP good. Franklin, 0 @ Sharon, 2 – Final – Click here for a recap of the game. Sharon, 0 @ Franklin, 2 – Final – Miranda Smith and Emily Mastaj each scored a goal for the Panthers while Halle Atkinson and Calen Frongillo both notched an assist in the win. Stoughton, 0 @ Norwood, 1 – Final – Stoughton head coach Tara Daniels said Emma Harrington had a strong game in net and Mia Greene played well up front for the Black Knights. Canton, 0 @ Notre Dame Academy, 3 – Final – The Canton Bulldogs gave the defending State Champions a run for their money but ultimately fell 21-25, 18-25, 21-25. “They were definitely the hardest hitters we’ve seen this year,” head coach Pat Cawley said of the undefeated Cougars. Erika Lum played good defense leading Canton with 16 digs (along with three kills) and Julia Panico added 11 digs. Cawley had high praise for setter Nicole Poole – “she was awesome, making something out everything no matter where the pass.” – finishing with 18 assists and two kills. Casey Shea had a big night on offense with seven kills and no errors and added four blocks while Emma Murphy had three blocks and three kills. Franklin, 3 @ Sharon, 0 – Final – Franklin middles Meaghan Maguire and Maggie Doyle “were dominant at the net” according to Panther head coach Kate Horsmann. Maguire registered a pair of kills and five blocks while Doyle had two aces and three blocks. Erin Skidmore had four aces, 16 service points, eight kills and four digs for the Panthers while Ellie Wisniewski chipped in with five kills and Maddie Kuzio had 18 digs and an ace. Franklin, 2 @ Sharon, 0 – Final – Franklin senior Dana Lewandowski netted what turned out to be the game winner just five minutes into the first half as the Panthers picked up their seventh win of the season. Sophomore Annie Walsh scored with just under three minutes remaining to ice the game for Franklin. Franklin head coach Lisa Cropper said Kate Morse “did an outstanding job in the midfield” for the Panthers. Taunton, 0 @ Stoughton, 4 – Final – Olivia Schlehuber led Stoughton’s offense, scoring a pair of goals in the win. Julia Russell and Kelli Joyce scored each scored once for the Black Knights. Gianna Barbosa and Meghan McSweeney combined for the shutout in goal. Oliver Ames, 157 @ Franklin, 166 – Final – Oliver Ames clinched the Kelley-Rex title outright with a win over Franklin at Franklin Country Club. The win marks Oliver Ames’ fourth straight outright league title and fifth straight overall. Brady Allbritton and Nick Lombardi both shot 37 to lead the Tigers. Matt D’Errico carded a 40 for the Panthers and Bryan Woelfel finished with a 41. Mansfield, 173 @ Sharon, 171 – Final – Sam Fritz had the low score for Sharon with a 41, helping the Eagles edge Mansfield at Spring Valley Country Club. Jason Hindman was the match medalist, shooting a one over 37 for the Hornets. CANTON, Mass. – Prior to Thursday night’s game, senior setter Nicole Poole took the microphone and addressed the large crowd of students, family members, and friends sitting in the Canton High gym. She spoke about her best friend Alaina Goodwin, a fellow senior who was stricken with a rare spinal cord stroke that has left her immobile from the waist down and who was the inspiration for Ace It For Alaina. Poole and the other Canton captains presented flowers to Alaina’s parents and to her twin sister Darria before posing for a photo. When the pregame ceremony was done, the Bulldogs took the emotion of the evening and channeled it into a dominating sweep of visiting Oliver Ames, winning 25-15, 25-16, 25-11. It was fitting that on match point, Poole toed the service line and fired her sixth ace of the night to seal a victory in honor of her good friend. She added 17 assists, 10 digs and five kills in a stellar all-around performance. It definitely felt like a storm at the start of the game, as a raucous student section echoed through the gym to spur on the Bulldogs. OA jumped out to a 3-0 lead to start the game, but Canton would start to take control behind senior middle hitter Casey Shea, who had five of her seven kills in the opening set. OA’sKatie Flynn kept it close with three kills and Kayla Raymond added two of her nine kills in the first but Poole closed out the set with a quick kill of her own. The game stayed close in the second set, until Poole stepped to the service line with the Bulldogs leading 11-10 after a kill by OA’s Emma Petrillo. 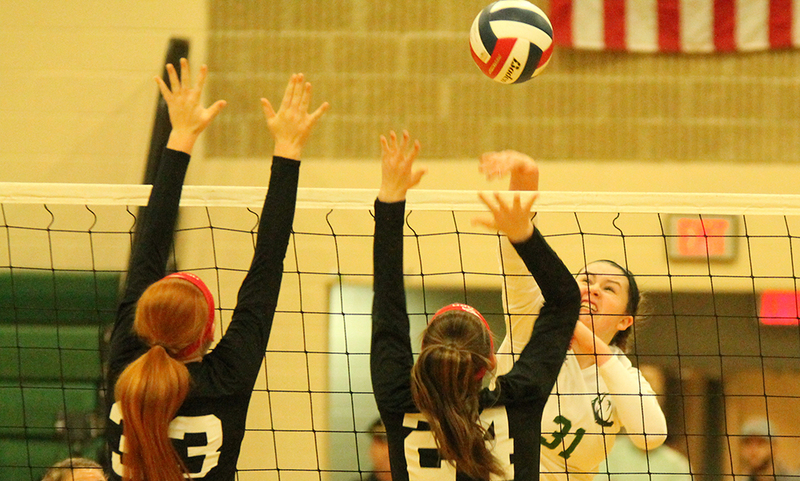 Canton would win the next six points, three of them on Poole aces and one on a kill by Emma Murphy. Despite three kills from Raymond down the stretch of the set, Canton pulled into a 2-0 lead in the match. The crowd got even louder in the third set and the Bulldogs continued to feed off the energy in the gym. Although OA would get 20 assists from senior setter Bridget McCarthy, the Tigers struggled to get a rhythm going. Outside hitter Erika Lum had a couple of kills for Canton and libero Julia Panico and Emily Lynch kept the plays alive defensively. Sophomore Theresa O’Brien added two kills in the final few points. Poole stepped up to win the match with a grin that stretched from ear to ear and sent in another solid serve that the Tigers could not return. “It was an overwhelming feeling when the final shot went in,” she explained. The players put back on the purple t-shirts made for the occasion and, after making a video to send to Alaina, gathered around the Goodwin family for a moment with Alaina’s parents. “Volleyball is important, we work hard, we want to win the Hock, we want to win a state championship, but when you have a kid that is paralyzed it put everything in perspective,” said Cawley, who praised her team for being able to refocus on the game in the midst of everything. A fundraising page has been established for the Goodwin family to help while Alaina remains at Spaulding Rehabilitation Hospital in Charlestown, where Darria said there have been noticeable improvements. To support the Goodwin family, visit https://www.gofundme.com/2m29n9y4. Canton (10-1) will play again on Friday in its first non-league game of the season against defending Div. 2 state champion Notre Dame Academy (Hingham). Oliver Ames (7-7, 6-5) will have three home games next week beginning with Franklin on Monday.